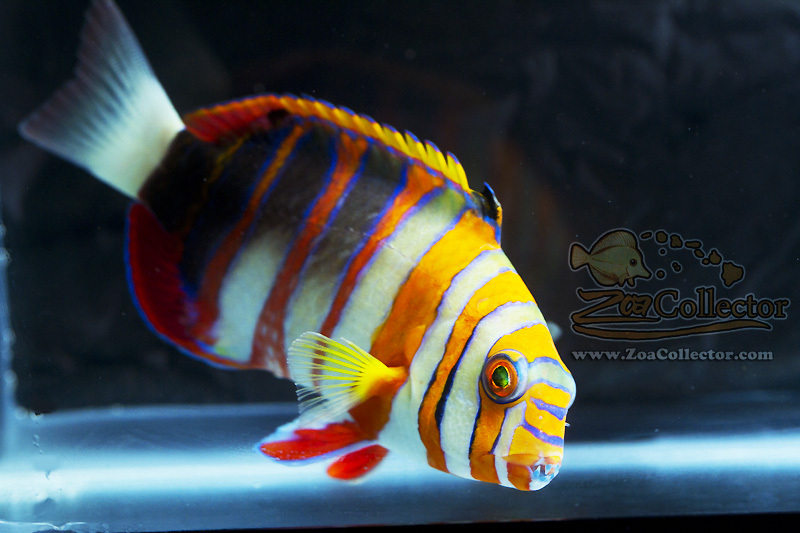 Harlequin Tusks, and all tuskfishes, are aggressive feeders looking for invertebrates and small fish in the sand and around the tank. They will eat through hermit and snail shells so if you plan on having them in your reef tank you need to take that into account, otherwise they do better in FO or FOWLR tanks. When looking to purchase a Harlequin Tusk, the better ones come from Australia. They’re better than the ones from Philippines, as they’re much hardier, eat right away, and are usually in better condition; not to mention they have better colors. The ones from the Philippines don’t usually have a good survival rate and often die within a short time, either from not eating or something not being right with them due to how they where collected. The difference between the two is that the Australian one has a lot more purple on the back of the body, the orange stripes are much brighter, as are the color of the teeth. So even though the Australian ones cost more they’re usually worth the price.